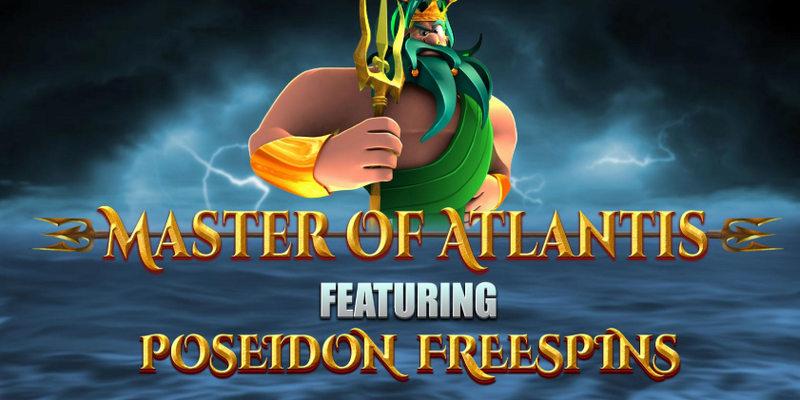 Casumo has added a new exclusive online slot game by Blueprint Gaming, Master of Atlantis. This game is only available at Casumo until mid-June. The game uses an underwater, Atlantis theme and comes with 40 lines on 5 reels, 4 symbols high. Symbols may appear stacked on all reels. Getting 3, 4 or 5 bonus symbols will award the free spins feature. You will receive 1, 2 or 3 power spins when triggering the bonus with 3, 4 or 5 bonus symbols respectively. There are only special trident symbols on the reels during these power spins. The more you get on-screen the bigger these symbols will be worth during the free spins itself. Collecting all 20 symbols during the power spins will award 100 times bet for each trident symbol during free spin. After the power spin you will receive 5 free spins. Each trident symbol that lands on the reel will reward you with the amount you collected during the power spins. You can even get extra power spins or extra free spins when landing the bonus symbol during free spins. During any normal spin this feature can randomly appear turning a number of random symbols into mystery symbols. After this all these symbols will change into one and the same symbol. Blueprint Gaming already has one other slot game which uses the same features. But that game isn’t as themed or pretty looking as this one. I am sure this game will attract a lot more players. You can really win a lot during the free spins feature if you collect enough during the power spins. And it is also nice you can increase the reward when landing additional bonus symbols. I really like this new slot game and would recommend trying it. Visit Casumo now to play this exclusive Blueprint Gaming slot game and also a huge selection of other slot games.